A little something sweet to start your week off. Yes, even we stop with the spicy and savory for the occasional sweet treat. 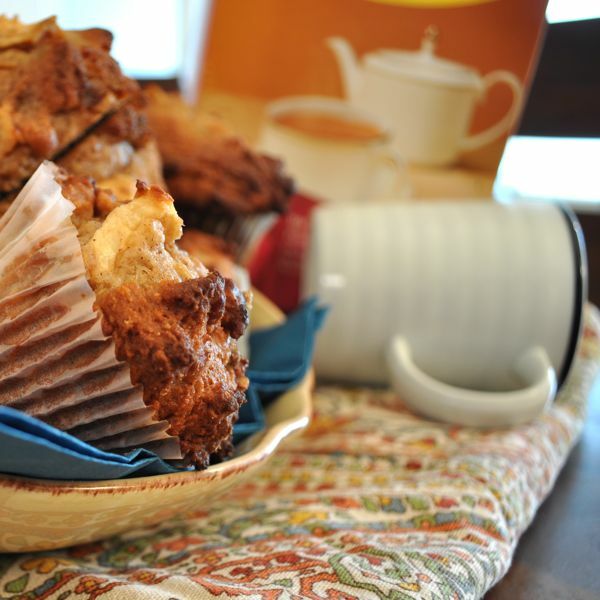 Moist whole wheat muffins studded with sweet cinnamon spiced apples and crunchy nuggets of pecans topped with brown sugar. The perfect treat with a cup of chai on a cold, rainy day. I made a batch of a dozen last night using this recipe from Smitten Kitchen. The only change I made was to use half of the butter Deb called for (I used 1/2 a stick), and I added one-fourth a cup of chopped pecans for texture. Also, I used Siggi’s Strained Vanilla Non-fat Yogurt. It’s an easy to follow, no stand mixer required recipe that even a non-baker like me can make! Preheat the oven to 450°F. In a small mixing bowl, mix together the flours, baking powder, baking soda, salt and cinnamon. In a larger mixing bowl, cream the butter and add the sugar and 1/4 cup of the brown sugar. Beat until fluffy then add the egg and mix well. Mix in the yogurt. Stir in the dry ingredients and fold in the apple chunks and pecans. Drop muffin cups into a muffin tin. Divide the batter evenly among the cups. The muffins will not rise much so fill the cups to the top. Sprinkle the remaining 1/4 cup brown sugar on top of the muffins. Bake for 10 minutes, turn the heat down to 400°F and bake for an additional 5 to 10 minutes until golden, or until a toothpick inserted into the center of a muffin comes out clean. Wait 5 minutes then turn the muffins out onto a plate or a wire rack to cool. What a beautiful way of photographing a muffin. Looks perfect. I’m making a modified version of these: cinnamon pear cranberry. Next post: Planning an Indian Menu: What to Serve with What?